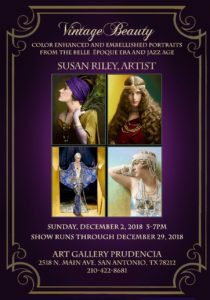 If you love old Hollywood and the glamor of the Jazz Age, you will probably be fascinated by the unique show currently on view at the Art Gallery Prudencia. 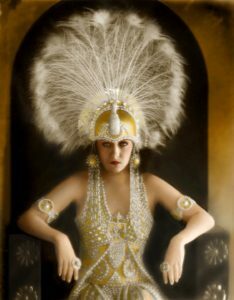 You’ll find yourself surrounded by large photos of divas such as Gloria Swanson and Louise Brooks, looking like you have never seen them before. 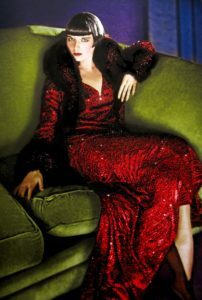 These color-enhanced and hand-embellished portraits are the work of photographer/artist Susan Riley, who developed her own techniques to show how the stars from black-and-white films might have looked in real life when decked out in their sumptuous attires. Riley’s process is labor-intensive and time-consuming. She starts by researching the life and times of each woman to find out facts such as the color of her eyes and hair, and watches the actress’ movies or whatever film clips may exist of stage stars or other glamorous women of that period. Then, using Photoshop, Riley restores old photos and applies color to face and clothes to create a dramatic true-to-life image. After making a fine print of it, she embellishes the portraits with hand-applied Swarovski crystals, faux pearls, other crystals and beads, in addition to hand-painting shimmering micro-fine glitter at some places. Some portraits take 10 hours to complete while others may require a couple of weeks. It all started with baby pictures which Riley liked to enhance with wings and halos. Soon, she was adding glitter and other embellishments. Then, a few years ago, a client asked her to blow up a 1920s cowgirl photo she had and add color and decorations. Before long, Riley fell in love with this kind of work and found her unique niche. A recent work, the portrait of Lakota Chief Sitting Bull, was auctioned off at the Bryan Museum in Galveston for $7,000. The Gallery Prudencia exhibit features 21 portraits available for sale, and a few that are not. Each is a work of art and a conversation starter. I have seen some of her work in person and it is an amazing kind of magic the way the crystals and other applied jewels and glitter makes the light dance and move in such a stunning and vibrant way.